A few Friday mornings ago I had the pleasure of doing an interview for a woman planning to write a book about mental and spiritual awakenings through freediving. The interviewer was a nice woman who asked really insightful questions. Sure she asked a bit of the same old thing I get all the time, “How did you get into this?” “How long can you hold your breath?” But the really interesting questions included, “Does freediving make you a better person?” “Can you compare the dive to a religious experience?” The questions that are asked to get a better perspective on why we do this. The interviewer informed me, and I have heard this particular parallel drawn many times before, that freediving is like a religious experience. Most freedivers probably use the word “spiritual” as opposed to religious as they are afraid to be mistaken for someone who actually believes in God. No logically thinking freediver wants to be mistook for a Christian. It is much easier to be accepted as a Buddhist, Yogi, or even “Clan of the Cave Bear” (yep, just made that reference for you, Wendy) but the sensation, the “spiritual” freediver feels is not a religious experience. 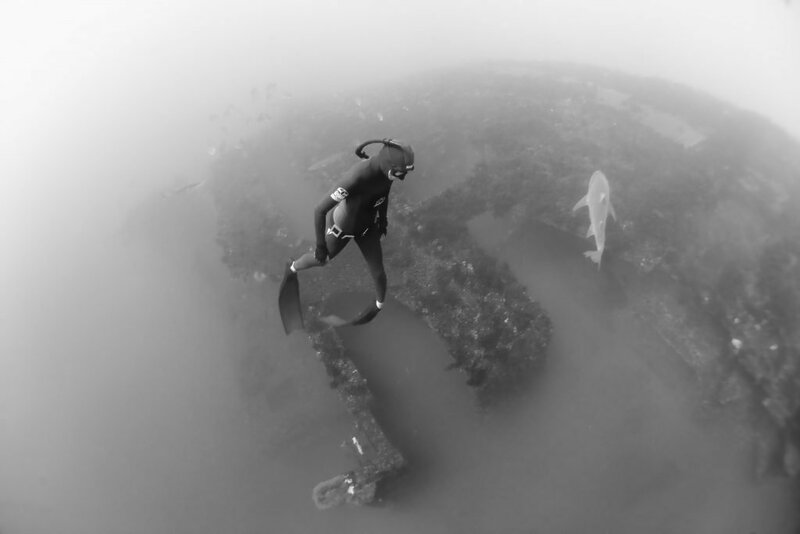 The sinking down to depth may reveal a lot about the diver. The freediver may become acquainted with a part of themselves that is not stimulated regularly. The very base instinctual parts of themselves that step forward, by-passing the logical part of the brain, to intervene in life and death situations, relying on a catalogue of experiences to motivate the mind and body into a proper course of action. It is our battle with this force of our own nature that compels us to depth. Like the battle of good vs. evil, God vs. Satan or even the dichotomy between Shiva the Destroyer and the Creator, the diver battles between letting go completely and surrendering to the depth or bailing out of the dive, turning early, as one of the two parts of the character reigns victorious over the dive. These parts being either the instinctual side, the fight or flight response to lack of oxygen, one of our most primal fears or the little bit of darkness inside us that let’s us know we aren’t worthy, aren’t strong enough, aren’t brave enough to let go. Through this battle the parallel is drawn between the archetypical battle of good vs. evil, and the dive. Therein lies your religious experience. I baulk when the freedive is compared to a religious experience because no new knowledge is gained of God. The only new information gathered is of the self, which is in direct opposition of a true religious experience which must include God. However, the internal battle fought in the several seconds of sink a freediver is allotted is a powerful thing. It is a special realization that will make you a stronger, more well adjusted person. Freediving will not, however, do anything for your salvation.